Located in a period 1930’s building in Echo Park Los Angeles the OBEY Building houses artist and graphic designer Shepard Fairey‘s studio, design agency and art gallery. Our goal was to create cohesive functional spaces with common design elements for each of the different parts of Shepard’s studio, gallery and design offices. One of the challenges was to integrate and organize the various public and private functions from production, design, and administrative areas together as a functional whole. The original existing two level building was an amalgamation of old renovations from the 1930s thru to the 70s and had no floor to floor connection so a stairwell was an integral part of our scheme -we created a birch paneled stair well that connects the upper level administrative area to the lower gallery, conference, and print shipping areas. The interior finishes and custom designed furniture for each of the areas were designed to complement Shepard and Amanda’s design aesthetic but not be a distraction. The main open design studio was created by structurally re-configuring and exposing the timber roof beams to make a larger space. Plywood and weathered steel modular desk and storage units allow the design studio and production areas to be flexible and functional. A custom layout and table integrates a light box and art material storage and large plywood tables in the conference rooms double as layout tables for print and artwork. The gallery space functions as a series of display rooms connected by a hallway and terminating at a reception bar and gallery retail counter and display at each end. We took care to maintain and integrate many of the old existing interior details with the new spaces that were created. 60’s ceiling molding and arches were contrasted with plywood floors, weathered steel and birch wall surfaces. 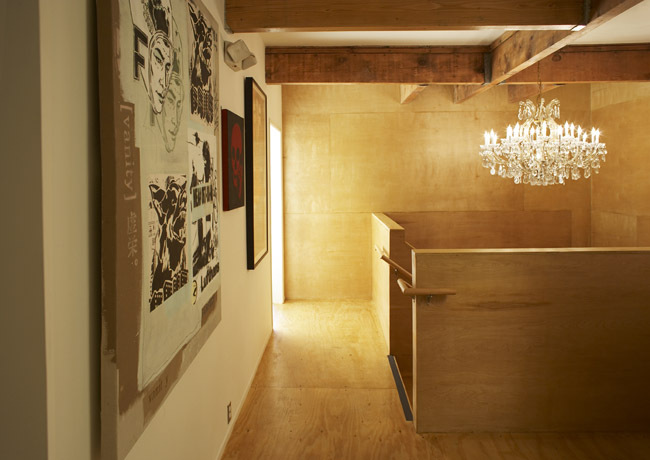 An existing old chandelier was re-purposed to light the main internal stairwell. Many of the materials that we chose were also for their environmental qualities; sustainably harvested plywood with low VOC finish stains and second generation steel elements were used throughout the spaces. Working with Shepard and his team was for one fun. He and Amanda are amazing people that are committed to bettering our lives through art and of course Shepard’s iconic design sensibilities. Shepard and Amanda genuinely understand and appreciate the value of design and working with them allowed us to take inventive leaps that conventional clients would not really be open to and really made the process personally satisfying.